Who'd have thought that excessively bending a phone would cause problems? Is this what we have to look forward to from flexible phones? The LG G Flex is designed to be flexible, as highlighted by its curved display. 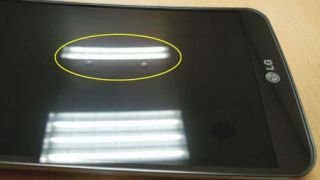 But it seems that excessively bending the device can lead to small bumps developing on the screen. It could be a common issue too, as according to an electronics salesclerk who spoke to the Korea Times, all of the LG G Flex handsets that he'd seen had come with small bumps. Thankfully it doesn't look like the problem has any impact on the handset's performance. LG is aware of the issue and released a statement to the Korea Times saying that "because key components inside the G Flex such as the glass cover, OLED display, battery and frame are elastic, excessive or frequent force that flattens the device may produce bumps. The issue has no relation to the performance and quality of the device." The good news is that the bumps are temporary and should disappear over time, or if you'd rather not wait you can even just push down on them and that should solve the problem. If the thought of a bumpy screen hasn't put you off the LG G Flex, you can now pre-order it for a hefty sum. The future's bright, the future's flexible.